A beautifully poetic vision worth sharing. Neglecting “baby steps” to the cosmos weighs heavily on my mind. Some weeks ago I vowed an attempt to impart my cosmic awe and wonder through simple descriptions of the sky above. Nothing fancy, no pretentious gobbley gook – observations intended to build confidence by way of baby steps. Occurring to me the big picture was daunting, the logical approach being to build interest one little step at a time. Not foolish enough to think wonder grows from baby steps – my secret hope rests with enthusiasm being contagious. Even a mild case of inexplicable star gazing or random reference to sky points by a single reader of my baby steps project would make the world a better place. Arcturus is a massive star in the constellation Bootes – a bit of a rogue, Arcturus doesn’t follow along with other stars in the Milky Way. Instead it travels perpendicularly at 150 kilometers a second, a path that will completely remove it from earthly skies a few million years from now. Find the last star on Big Dipper’s handle – draw a line with your eye until you reach a large orange star. Say hello to Arcturus. 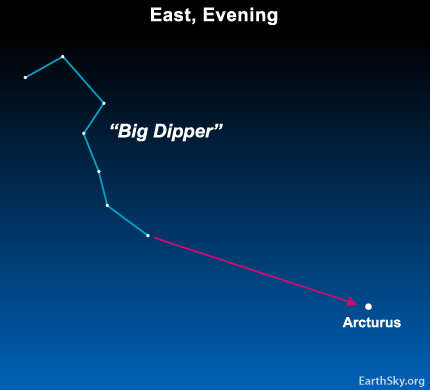 Arcturus isn’t particularly large or predominant – that isn’t what matters. All that counts is you try to find it – once you find and file Arcturus in your mind you’ll be wiser and stronger than before.